The Essex Yeomanry was a Reserve unit of the British Army that originated in 1797 as local Yeomanry Cavalry Troops in Essex. Reformed after the experience gained in the Second Boer War, it saw active service as cavalry in World War I and as artillery in World War II. Its lineage is maintained by 36 (Essex Yeomanry) Signal Squadron, part of 71 (Yeomanry) Signal Regiment, Royal Corps of Signals. After Britain was drawn into the French Revolutionary Wars, the government of prime minister William Pitt the Younger proposed on 14 March 1794 that the counties should form Corps of Yeomanry Cavalry that could be called on by the King to defend the country against invasion or by the Lord Lieutenant to subdue any civil disorder within the county. Prominent landowners came forward to recruit the new force. The first Troop of Yeomanry in Essex was formed in 1797 by John Conyers of Copped Hall near Epping. The 2nd Troop was recruited in the Chelmsford district in February 1798 by William Tufnell of Langleys at Great Waltham, and the 3rd Troop was raised in March by John Archer-Houblon of Great Hallingbury. By the end of May that year there were 15 Troops across Essex, with an establishment of 640 men. Lieutenant-Col Palmer retired from the command in 1868 and was followed by a series of commanding officers (COs) in quick succession. In 1871 the declining unit reverted to its old title of Essex Yeomanry Cavalry. The government ordered the disbandment of the artillery troops in 1876, and when there were only 46 men on parade in September that year it ordered the CO, Lt-Col T. Duff Cater, to wind up the whole unit. It was disbanded on 31 March 1877. Yeomanry activity in the county did not entirely disappear: Captain Richard Colvin raised an Essex Troop of the Loyal Suffolk Hussars in 1889. The Boer War was still going on, and further volunteers went out to South Africa with the second contingent of the IY. Major J.H. Patterson, DSO, of the Essex IY, was appointed Temporary Lt-Col to command the 33rd Battalion on 17 January 1902. The Imperial Yeomanry were subsumed into the new Territorial Force (TF) under the Haldane Reforms of 1908. The regiment simply dropped 'Imperial' from the title and was designated as Dragoons. Lieutenant-Col Colvin handed over command of the regiment to Lt-Col 'Ned' Deacon in February 1911. In accordance with the Territorial and Reserve Forces Act 1907 (7 Edw. 7, c.9), which brought the Territorial Force into being, the TF was intended to be a home defence force for service during wartime and members could not be compelled to serve outside the country. However, on the outbreak of war on 4 August 1914, many members volunteered for Imperial Service. Therefore, TF units were split in August and September 1914 into 1st Line (liable for overseas service) and 2nd Line (home service for those unable or unwilling to serve overseas) units. Later, a 3rd Line was formed to act as a reserve, providing trained replacements for the 1st and 2nd Line regiments. The CO reported that the men were all medically fit, fully trained, and aged 19 years or older, and the regiment was accepted for overseas service. However, delays in obtaining replacement kit and new saddles delayed the regiment's departure for the Western Front until late November, and it just missed being eligible for the 'Mons Star' issued to the 'Old Contemptibles'. The regiment landed at Le Havre on 1 December and joined the Royal Horse Guards (RHG) and the 10th Royal Hussars in France on 12 December 1914 as part of 8th Cavalry Brigade, 3rd Cavalry Division near Hazebrouck. [a] It remained on the Western Front for the rest of the war. The regiment saw its first action at the Battle of Frezenberg Ridge on 13 May, when in pouring rain it made a dismounted bayonet charge that recaptured the disputed German front line trench. But having suffered substantial casualties from artillery fire, it was ordered to withdraw with the rest of the brigade. All told it suffered 51 killed, 91 wounded and 19 missing: a total of 161out of 302 who went into action. Among the dead were the CO, Lt-Col Deacon, and his acting second-in-command, Maj Roddick. Most of the dead, including Lt-Col Deacon, were buried in unmarked graves and are now commemorated on the Menin Gate Memorial to the Missing at Ypres. The regiment later chose Ypres 1915 and Frezenberg as the first two Battle Honours to be emblazoned on its guidon. The surviving 149 Yeoman under the command of Maj Tony Buxton went into reserve at Hooge. A Regular Army officer, Lt-Col Wickham of the KDG, was brought in as CO to train and integrate the replacement drafts into the regiment. Major Whitmore, who had been wounded on the morning of 13 May and thus missed the afternoon assault on Frezenberg Ridge, returned in September and took command with the rank of Lt-Col. Popularly known as 'Brasso' he remained in command until 1918. The regiment was present with the rest of 3rd Cavalry Division defending Loos during the Battle of Loos (26–8 September 1915), but did not see serious action again until 1917. The regimental machine gun section was combined with those of the other regiments to form the 8th Brigade Machine Gun Squadron, Machine Gun Corps (MGC), on 29 February 1916. On 11 April, the second day of the Battle of the Scarpe that launched the Arras Offensive, 8th Cavalry Bde was ordered to advance mounted, over open country, to occupy high ground east and northeast of Monchy-le-Preux, a key position between the rivers Scarpe and Sensée. The Essex Yeomanry led the movement, with the 10th Hussars on its left and the RHG in reserve. C Squadron, leading, came under heavy machine gun fire while crossing a bridge and the Stortford and Dunmow Trps were almost annihilated. The Yeomanry and Hussars pressed on and occupied Monchy, where they dug in. The CO of the 10th Hussars having become a casualty, Lt-Col Whitmore commanded all the troops in Monchy. The two regiments and machine gun sqn held their positions in and around the town against determined German attacks for 18 hours before being relieved by infantry. The Essex Yeomanry suffered 135 casualties ad almost all their horses were killed. Lance-Corporal Mugford of the MG Sqn won a Victoria Cross in this action. On 14 March 1918, the 1/1st Essex Yeomanry left the brigade to become a cyclist unit, then to form a machine gun battalion with the Bedfordshire Yeomanry. The German Spring Offensive forestalled this plan, and the regiment was remounted on 28 March and sent to the 1st Cavalry Division. From 4 April, it was split up with a squadron joining each regiment in 1st Cavalry Brigade (2nd Dragoon Guards, 5th Dragoon Guards and 11th Hussars). The squadrons' contributions were cred towards the regiment's battle honours. After the regiment was broken up, Lt-Col Whitmore commanded the 10th Hussars until 1919, the only TF officer without previous regular service to command a regular cavalry regiment during the war. The 2nd Line regiment was formed at Colchester in 1914. In October, it moved to Wickham Market and by January 1915 it was in the 2/1st Eastern Mounted Brigade at Huntingdon. From June 1915 to March 1916, it was at Hounslow. On 31 March 1916, the remaining Mounted Brigades were ordered to be numbered in a single sequence; the brigade was numbered as 13th Mounted Brigade and joined 4th Mounted Division at Great Bentley. In July 1916, there was a major reorganization of 2nd Line yeomanry units in the United Kingdom. All but 12 regiments were converted to cyclists; the 2/1st Essex Yeomanry remained mounted and transferred to the 3rd Mounted Brigade in the new 1st Mounted Division (3rd Mounted Division redesignated) at Leybourne Park, Kent. It moved to Brasted near Sevenoaks in March 1917. In September 1917, the 1st Mounted Division was converted to The Cyclist Division and the regiment became a cyclist unit in 13th Cyclist Brigade of the division at Sevenoaks. In December 1917, the 13th Cyclist Brigade was broken up and the regiment was posted to the 6th Cyclist Brigade in Ireland in January 1918. It remained with the 6th Cyclist Brigade until the end of the war, stationed at The Curragh. The 3rd Line regiment was formed in 1915 and in the summer it was affiliated to a Reserve Cavalry Regiment in Eastern Command. In April 1916 it was affiliated to the 2nd Reserve Cavalry Regiment at Aldershot. Early in 1917 it was absorbed into the 4th Reserve Cavalry Regiment, also at Aldershot. One Essex Yeoman was awarded the Victoria Cross (VC) during World War I. Harold Sandford Mugford, a shipping clerk born in Bermondsey in 1894 and brought up in East Ham, had joined the Essex Yeomanry in 1912. Mobilised in August 1914, he had served with the regiment at Frezenberg Ridge and Loos. In March 1916, as a member of the regiment's machine gun section he was transferred to the 8th Squadron, MGC, which supported 8th Cavalry Brigade. After the brigade had taken Monchy on 11 April 1917, L/Cpl Mugford placed his machine gun in an exposed forward position and drove off the enemy who were massing for a counter-attack. His No 2 was killed almost immediately and Mugford was severely wounded, but he refused to go to the dressing-station and continued to operate his gun, inflicting further losses on the enemy. A short time later a shell broke both his legs, but he remained at his gun, urging his comrades to take cover. He was then removed to the dressing-station, where he was also wounded in the arm. Mugford survived, despite the los of both legs, and was awarded the VC for his conspicuous bravery. The regiment was reconstituted in 1920 as part of the Territorial Army with regimental headquarters at Colchester. In 1921, the regiment was converted from cavalry to artillery and became the 104th (Essex Yeomanry) Brigade, Royal Field Artillery. In 1932, with regimental headquarters and 413 Battery transferred to Chelmsford, the regiment gained a 339 (Essex Royal Horse Artillery) Battery based at Colchester. In 1938, the regiment was renamed 104th (Essex Yeomanry) Regiment, Royal Horse Artillery (RHA). At the outbreak of the World War II in 1939, the "104th (Essex Yeomanry) Regiment, RHA" formed a duplicate regiment as part of the increase in British military manpower. 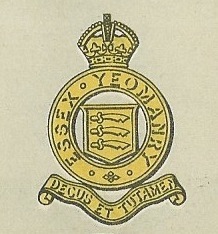 The second Essex Yeomanry regiment was designated 147 Regiment RHA (Essex Yeomanry), and reclassified as a field regiment in 1941. In 1942 both 147th (Essex Yeomanry) and 86th (East Anglian) (Herts Yeomanry) Field Regiments supplied cadres to help form 191st (Hertfordshire and Essex Yeomanry) Field Regiment, Royal Artillery. The first line regiment went to the Middle East in 1940 and served in most of the Western Desert battles, notably the Battle of El Alamein and the Siege of Tobruk. It went on to fight in the Italian Campaign and was stood-down in Austria in 1946. The new regiment landed on the beaches of Normandy on D-Day, 1944. It was equipped with Sexton Self Propelled 25 Pounder guns and fought with the British 8th Armoured Brigade as a spearhead unit through France, Belgium, the Netherlands, and into Germany. Another regiment, 14th RHA, was formed in India on 1 September 1942. It commanded 414th (Essex Yeomanry) Battery from 104th RHA, 524th Battery (formerly independent) and the newly formed 525th Battery. The Regimental Headquarters, 524th and 525th Batteries were disbanded on 27 April 1946 and 414th Battery was placed in suspended animation in Middle East Land Forces on the same date. 414th Battery was reconstituted in 304th (Essex Yeomanry) Field Regiment, Royal Artillery on 1 January 1947. The regiment was re-raised on 1 June 1947 as 304th (Essex Yeomanry) Field Regiment RA with headquarters at Chelmsford and batteries at Colchester (P), Southend (Q), and Harlow (R). The Royal Horse Artillery designation was restored in February 1955. Following the defence cuts of 1967, the unit was reduced to squadron status as 70 (Essex Yeomanry) Signal Squadron, part of 71 Yeomanry Signal Regiment, Royal Corps of Signals. On 25 April 2009, 70 (Essex Yeomanry) Signal Squadron was awarded the freedom of Harlow. Following the reorganisation of the Royal Signals Reserves in 2009, 68 (Inns of Court & City Yeomanry) Signal Squadron merged with 70 (Essex Yeomanry) Signal Squadron to form 68 (Inns of Court & City and Essex Yeomanry) Signal Squadron. Under Strategic Defence and Security Review in 2014, 907 Signal Troop was subordinated to 36 Signal Squadron, which then became 36 (Essex Yeomanry) Signal Squadron, part of 71 (Yeomanry) Signal Regiment. The Essex Imperial Yeomanry adopted the same colours for its full dress uniform as the neighbouring Loyal Sussex Hussars: green with scarlet facings. The Khaki service dress had green facings from 1901 to 1905, the red facings until 1908. Slouch hats with the left side turned up were worn in both orders of dress. In the TF, brass dragoon helmets with scarlet plumes, worn with white gauntlet gloves, were introduced in full dress for the 1911 Coronation. On becoming Royal Artillery the regiment retained its Yeomanry cap and collar badges and buttons, which were worn by all ranks until 1975. When the Essex RHA joined in 1933, the whole regiment adopted RHA-style ball buttons, but they bore the Yeomanry badge. In 1943, 147th Field Rgt adopted an embroidered regimental badge worn on both arms, consisting of three seaxes with green blades and yellow hilts on a red diamond. This was adopted by the whole regiment from 1947 to 1965. While attached to 8th Armoured Brigade, 1944–46, 147th Field Rgt wore a black Royal Armoured Corps beret. Post World War II, all ranks wore Rifle green berets with the Yeomanry badge in brass (embroidered gold wire for officers). The No 1 dress was rifle green with two scarlet stripes down the overalls. Cavalry shoulder chains were added to the green No 1 dress in 1955 when the RHA title was restored to the regiment. 70 (Essex Yeomanry) Signal Squadron wore Royal Corps of Signals cap badges on the green beret of the Essex Yeomanry. The Essex Yeomanry Band is one of the oldest established Military bands in the East of England, being originally formed in 1809. In 1830, the Commanding Officer of the West Essex Yeomanry was financially supporting the Band out of his own pocket. An 1846 engraving shows a black drummer mounted on a white horse, sporting a plumed turban. The other mounted bandsmen wore the Yeomanry uniform of the period. In 1877, the West Essex Yeomanry was disbanded, but later reformed to become the Waltham Abbey Town Band. However, this newly formed band proudly continued to wear the Yeomanry uniform. The Essex Yeomanry became gunners in 1921, but still retained the Band. By 1937, the band was in the full dress uniform of the Regiment, complete with plumed brass helmets. During the Second World War, the Essex Yeomanry Band was disbanded, but reformed in 1947. This was a difficult time for the players, as all the uniforms had been destroyed with the bombing of Chelmsford in 1943. In 1952, official recognition of the band was given by the War Office, but like the Regiment, it was withdrawn in 1968. The regimental march before World War I was Hoch Habsburg ('Hail Habsburg'), which was probably discontinued as inappropriate once war broke out with Austria-Hungary. In 1962 the CO, Col Hugh Hunter Jones, introduced The Coggeshall Man's Wedding as the regimental march. The regimental slow march is the Slow March of the Royal Artillery, but Duke of York may have been used ca 1959. The Royal Artillery was present in nearly all battles and would have earned most of the honours awarded to cavalry and infantry regiments. In 1833, William IV awarded the motto Ubique (meaning "everywhere") in place of all battle honours. The regimental war memorials to the Essex Yeomen who died in the two world wars are in St Peter's Chapel in Chelmsford Cathedral, together with individual memorials to L/Cpl Harold Mugford, VC, (unveiled in June 2006) to Brig-Gen Sir Richard Colvin and to Col Sir Francis Whitmore. There is also a memorial window to Sir Richard Colvin in the Lady Chapel of Waltham Abbey Church. A memorial to the men of 3 Troop, D Sqn, Essex Yeomanry, and other local Territorials who died in World War I was at the Army Reserve Centre at Romford. In May 2009 a memorial was dedicated in Saint George's Memorial Church, Ypres, to commemorate Essex Yeomen who died in the Ypres Salient, most of whom have no known grave and are listed on the Menin Gate Memorial to the Missing. The regimental memorial in Normandy is at Asnelles on Gold Beach. ^ a b Anon, Regimental Badges, 1941. ^ "Worcestershire Yeomanry Cavalry (1794-1994)". Archived from the original on August 15, 2004. ^ a b c d Foakes & Mckenzie-Bell, p. 6. ^ a b c d e f g h i j k l m n Essex Yeomanry at Regiments.org. ^ a b c d e Mileham, pp. 84–5. ^ a b c Foakes & Mckenzie-Bell, pp. 7–8. ^ a b c d e f Army List, various dates. ^ a b c d e Foakes & Mckenzie-Bell, p. 8. ^ "Sir Richard Beale Colvin". Essex Regiment & Essex Militia History. Retrieved 8 May 2015. ^ a b IY at Anglo-Boer War. ^ IY Companies at Roll of Honour. ^ Suffolk Yeomanry at Regiments.org. ^ Imperial Yeomanry at Regiments.org. ^ London Gazette 10 September 1901. ^ London Gazette, 27 September 1901. ^ a b London Gazette, 15 November 1901. ^ London Gazette, 20 December 1901. ^ a b c d e f g h i Essex Yeomanry at Long, Long Trail. ^ Colchester at Drill Hall Project. ^ Harwich at Drill Hall Project. ^ Walton-on-the-Naze at Drill Hall Project. ^ Clacton at Drill Hall Project. ^ Braintree at Drill Hall Project. ^ Halstead at Drill Hall Project. ^ Waltham Abbey at Drill Hall Project. ^ Loughton at Drill Hall Project. ^ Bishop's Stortford at Drill Hall Project. ^ Southend at Drill Hall Project. ^ Brentwood at Drill Hall Project. ^ Grays at Drill Hall Project. ^ London Gazette, 11 March 1902. ^ London Gazette, 9 May 1902. ^ a b Foakes & Mckenzie-Bell, p. 10. ^ a b c d e f g h i j k l Foakes & Mckenzie-Bell, pp. 11–5. ^ a b c d e Becke, pp. 17–23. ^ a b c d 3rd cavalry Division at Long, Long Trail. ^ "A Short History". Archived from the original on 24 February 2006. ^ a b Harold Mugford, VC, at Western Front Association. ^ a b c d e f g Litchfield, pp. 67–8. ^ Foakes & McKenzie-Bell, p. 20. ^ a b c "Military Units of Essex (4)". Essex Yeomanry association. Retrieved 17 November 2017. ^ "14th Royal Horse Artillery". Desert Rats. Retrieved 17 November 2017. ^ "Harlow Star 'Freedom of Entry to Essex Yeomanry'". ^ a b "History". The Inns of Court & City Yeomanry Association. Retrieved 17 November 2017. ^ "36 (Essex Yeomanry) Signal Squadron Colchester and Chelmsford". Ministry of Defence. Retrieved 17 November 2017. ^ Foakes & Mckenzie-Bell, p. 9. ^ Foakes & Mckenzie-Bell, p. 23. ^ Foakes & Mckenzie-Bell, p. 24. ^ a b c d e f g "History". Essex Yeomanry Band. Retrieved 17 November 2017. ^ a b c d e Foakes & Mckenzie-Bell, p. 33. ^ IWM War Memorial Register Ref 22220. ^ IWM War Memorial Register Ref 69795. ^ IWM War Memorial Register Ref 76520. ^ a b IWM War Memorial Register Ref 78260. ^ IWM War Memorial Register Ref 12425. ^ Foakes & McKenzie-Bell, pp. 17–8. Anon, Regimental Badges and Service Caps, London: George Philip & Sons, 1941. Maj R. Money Barnes, The Soldiers of London, London: Seeley Service, 1963. Farndale, General Sir Martin (1996). History of the Royal Regiment of Artillery: The Years of Defeat: Europe and North Africa, 1939–1941. Brasseys. ISBN 1-85753-080-2. Foakes, Colonel S.P. ; McKenzie-Bell, Major M. Essex Yeomanry: A Short History. Essex: Temperley Media/Essex Yeomanry Association. ISBN 978-0-9572333-0-0. Perry, F.W. (1993). Order of Battle of Divisions Part 5B. Indian Army Divisions. Newport: Ray Westlake Military Books. ISBN 1-871167-23-X. Wikimedia Commons has media related to Essex Yeomanry. "British Army". MOD. Retrieved 8 May 2015. "Essex Yeomanry Association". Retrieved 8 May 2015. "Essex Yeomanry Regimental Information". Essex Regiment & Essex Militia History. Retrieved 8 May 2015. "71st (City of London) Yeomanry Signal Regiment". MOD. Retrieved 8 May 2015. "36 (Essex Yeomanry) Signal Squadron Colchester and Chelmsford". MOD. Retrieved 8 May 2015. "68 (Inns of Court & City and Essex Yeomanry) Signal Squadron". MOD. Retrieved 8 May 2015. "Essex Yeomanry Band". Retrieved 8 May 2015.